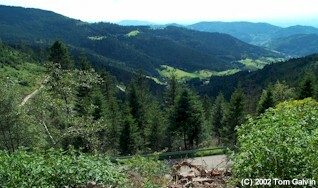 The Black Forest region is one of Germany's most popular tourist destinations. Like Bavaria to its east, the Black Forest combines great outdoor scenery with unique local customs, products, and fare. It is also the heart of Germany's timber and woodworking industry that generates much of the region's economy beyond tourism. In this part of Germany, the forest is everything, and therefore the forests are carefully managed. Each year, carefully selected plots of land are cleared of trees and replanted, under the watchful eye of forest rangers. The timber comes from a variety of pine tree that literally grows straight up without creating many branches, so the logs are very well suited for making lumber. Driving through, it seemed like every town had its own lumberyard and sawmill. In between would be piles upon piles of cut logs being watered down and readied for the mill. Trucks carrying huge loads of logs were commonplace. But one cannot argue with the results -- some of the world's best-quality wood products and the world's prettiest and best-preserved forests. The mixture of economic strength and environmental responsibility is a German strength, and it provides the world with a great place to visit to get away from it all. Get away to where you ask? Well, the region has over two dozen small towns and cities with loads of nature trails and scenic highways in between, but this travelogue covers three locations that are among the most visited. The city of Baden-Baden is sometimes referred to as the gateway to the Black Forest, as it sits among the foothills near Autobahn 5 not far from Strasbourg, France. Baden-Baden is best known for its therapeutic bathhouses. 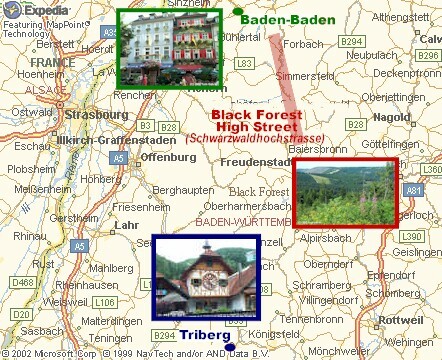 Closer to the center is the town of Triberg, home of Germany's largest waterfall and a great place to buy cuckoo clocks or try Black Forest Cake. 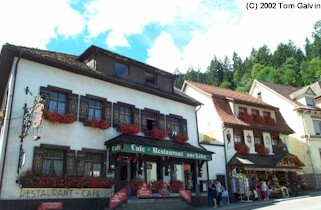 In between is the region's most scenic roadway, route B500, otherwise known as the Black Forest High Street. These three locations are identified in the below map, and linked to a chapter in this travelogue. Click the colored areas or words to access a chapter.